This podcast episode is all about adapting to a new normal and Richard Corbett from Wheels2Walking (W2W) joins us. Nine years ago Richard Corbett fell 50 feet which resulted in significant injuries including a spinal cord injury. Richard Corbett began a long road of adapting. 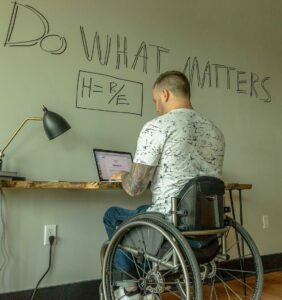 The road has led to Richard Corbett launching a platform called Wheels2Walking and he is making profound impacts within his community and the adaptive world. Richard is especially impacting those that have gone through a significant injury and need to adapt to a new normal, as he calls it! * Richard Corbett’s injury, his adaptive path, and finding your new normal after a dramatic life change. * Wheels2Walking, what it’s about, what it offers our listeners. * Insights on what Richard Corbett found effective when adapting and this includes overcoming physical and mental challenges spanning from learning to move again, dark depression, addiction, and other significant challenges.